The WWE has had its share of memorable, yet ridiculous characters through the years. 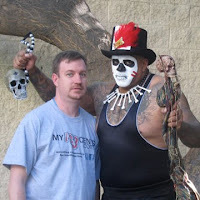 Case in point, today's subject Papa Shango. 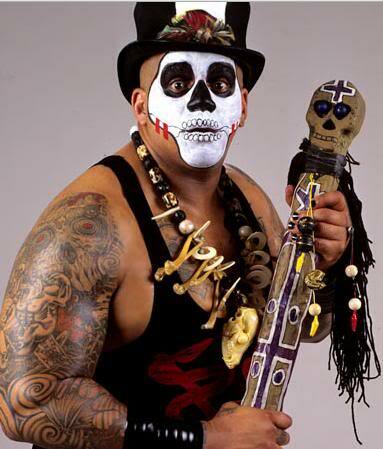 This voodoo master was arrived in the WWF in 1992 (holy cow, I can't believe it's been 20 years already). His biggest claim to fame in my view was when he ran interference during the Hulk Hogan-Sycho Sid match at Wrestlemania VIII. As the two heels were double teaming the Hulkster, the Ultimate Warrior made his big return. This set up a feud between the former champ and the unusual Shango. One particularly memorable time of the feud was when Papa put a hex on the Warrior, forcing him to vomit pea soup much like Linda Blair in the Exorcist. Shango did these kinds of tricks all the time, mostly to the jobbers he beat in the ring. I can remember one having either his boots or hands catch fire. That did happen, didn't it? Another time, the Warrior began sweating what looked like motor oil. It was reminiscent of those cheesy B movies from the 1970's and 80's. You definitely had to suspend reality when Shango was around. I only got to see him live in action once, and that was at a house show in Cape Girardeau. He challenged Bret Hart for the WWF heavyweight title. Hart won the match of course, but I can't remember if it was via the sharpshooter. Of course we know Papa Shango morphed into Kama the Ultimate Fighting machine before finding his most successful gimmick of the Godfather. No doubt though that as Shango, he made a good first impression on the WWE Universe before evolving into more realistic characters.